Snow Algae, Spirulina and Aloe juice combine to create a cooling and soothing gel mask designed to improve cellular defenses oxidative stress resistance, cell detoxification and repair while rejuvenating the epidermal dermal junction. This unique ingredient combination support the skin through tissue trauma and enhance the soothing and anti-inflammatory benefits. Dispense 1 tsp. 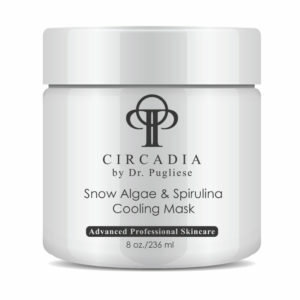 Snow Algae and Spirulina Cooling Mask into portion cup. Apply to face and neck with fan brush. Optional massage for 10 minutes. Remove mask with warm towel and 4×4 gauze. Pat skin dry.